The Space Outdoor Furniture Collection has an intriguing design that begs to be further inspected and ultimately enjoyed. 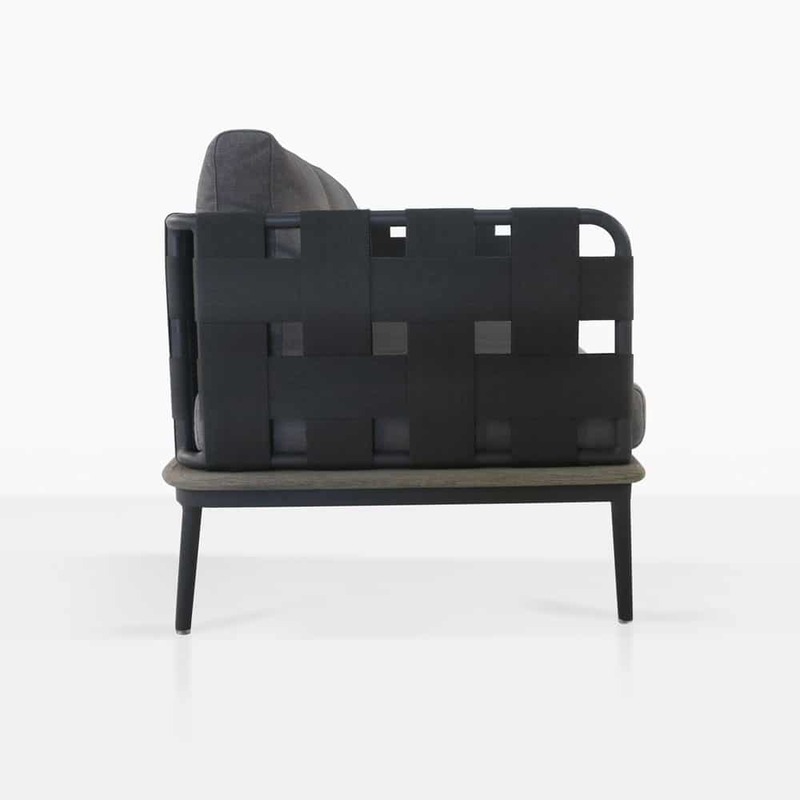 The Collection features fixed and modular units like this right arm three seater sofa. This can be paired with the left arm sofa or loveseat to create a long sofa or corner composition with a coffee table joining the two pieces. You can arrange the furniture any way you choose! The mix of premium materials and stunning design makes the Space Outdoor Furniture Collection highly desirable. Visit our showroom to inspect the Space Collection, try it out, and order it for your outdoor space. Positively premium style is reflected in the luxurious Space Sectional Right Arm Sofa with coal cushions, another glamourous piece from the divine Space Collection. Opulence, versatility in an urban design gives you more opportunity for comfort, relaxation and excellent impression! The Space Collection showcases simple and stylish details brought to life by the superb materials on offer. Beginning with the chic dark grey frame, which is lightweight yet robust. 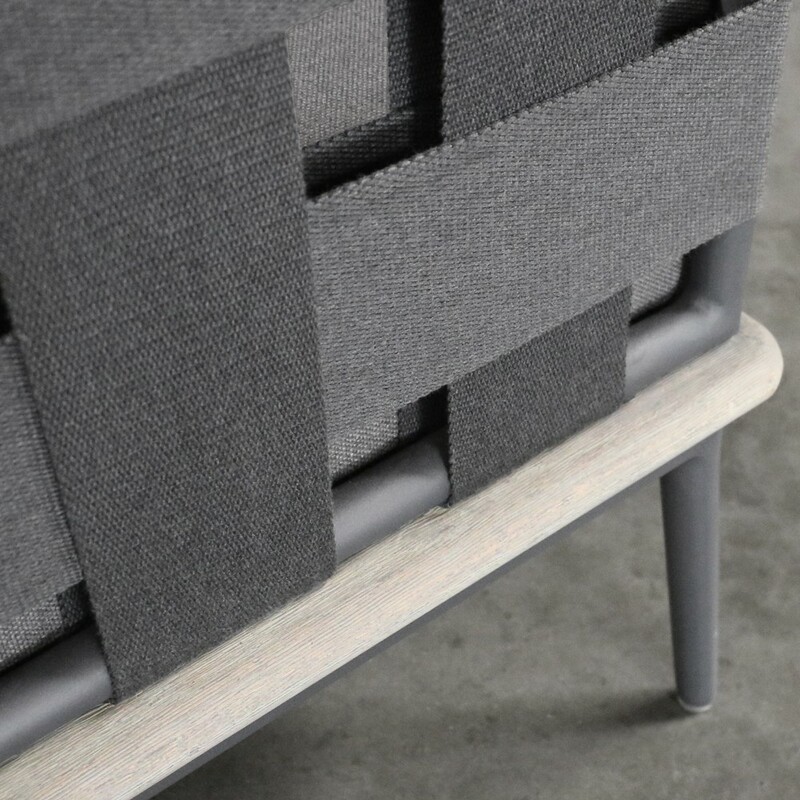 This is then edged with aged teak; a perfect framework to hold the incredible wrapped rope strapping, a unique and comfortable detail that takes this Space Collection to a new level. 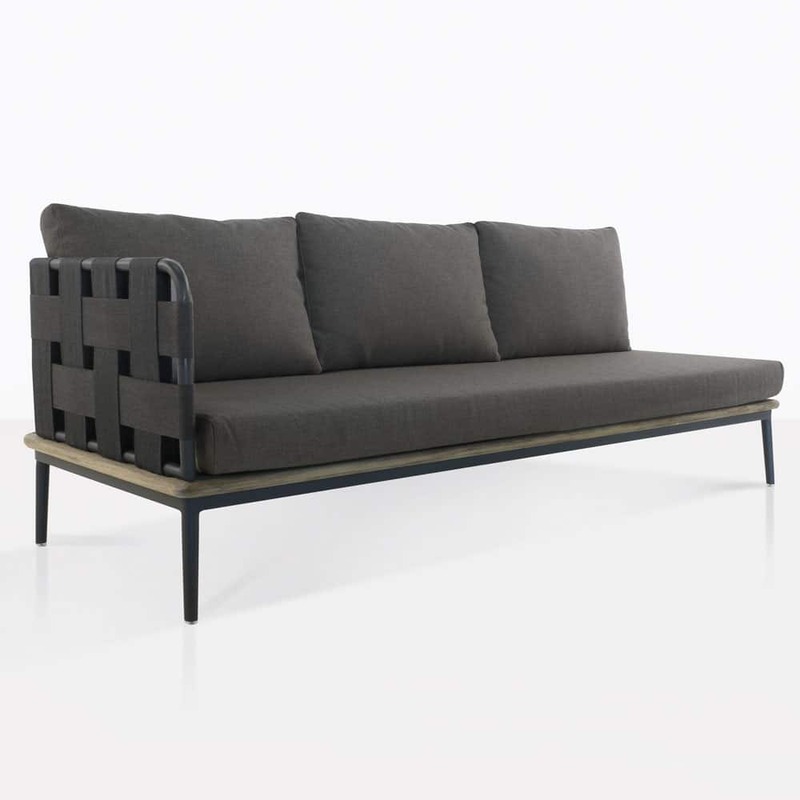 And if that weren’t enough, each piece boasts soft, cushy Sunbrella® cushions in coal which look and feel amazing! Curate a composition that is truly you! There are so many options! Whether you decide to open up your space to a large, welcoming sectional or go for something a little more minimal, the Space Sofa and suite will transform your area and enable you to relax in superior style. Why not try a Right Arm Sofa against the opposing Left Arm? This long, lavish sofa unit will enable your guests to enjoy the tranquil environment of your home. Or have the piece on its own with a gorgeous side table or coffee table for ultimate relaxation. Made from top of the line materials, the Space Right Arm Sofa and Collection is one that will keep you in comfort for years to come. Look at our materials page to learn about the incredible fabrics we use to ensure you have a lasting product! Design Warehouse has a wide range of outdoor accessories, seating, relaxing and dining furniture that will assist you in curating your open air living room! We are proud of our products, and encourage you to call us with any questions! The Space Sectional Sofa is available now! Call us now to order yours! 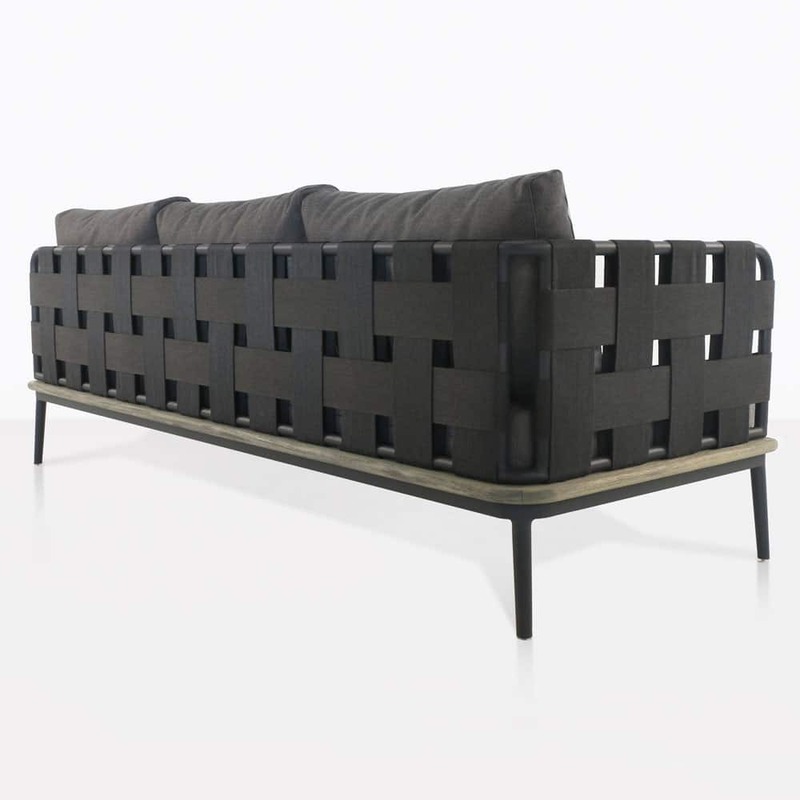 Design Warehouse uses rope fibers along with strong frames to make stunning furniture designs. It has been specially engineered to be used for outdoor furniture. It is durable, and weather resistant and will last for a long time with proper care. It is important to keep your rope furniture clean to keep it performing and looking its best. Wipe up any spills as quickly as possible. To spot clean an area apply a mist of mild soapy water and work in the solution with a soft cloth by blotting or using light pressure. Gently off the solution thoroughly and allow it to air dry. Do not use abrasive materials, excessive scrubbing or a high-pressure hose. And keep sharp objects away from the rope to avoid any cutting or fraying.